BY CONTINUING TO USE THE SERVICES, YOU ARE INDICATING YOUR AGREEMENT TO THE TERMS AND ALL REVISIONS THEREOF. You will not create accounts with the Service through unauthorized means, including but not limited to, by using an automated device, script, bot, spider, crawler or scraper. In addition, you agree and understand that you may be held legally responsible for damages suffered by other Service users or third parties as the result of Your remarks, information, feedback or other content posted or made available on the Website that is deemed defamatory or otherwise legally actionable. Under the Federal Communications Decency Act of 1996, Kudolife is not legally responsible, nor can it be held liable for damages of any kind, arising out of or in connection to any defamatory or otherwise legally actionable remarks, information, feedback or other content posted or made available on the WebsiService. Your use of the Kudolife Service is also subject to our End User License Agreement which grants you a limited, non-exclusive license to access and use the Service for your own personal, non-commercial purposes. This includes the right to view content available on the Kudolife Service. This license is personal to you and may not be assigned or sublicensed to anyone else. Except as expressly permitted by Kudolife in writing, you will not reproduce, redistribute, sell, create derivative works from, decompile, reverse engineer, or disassemble the Kudolife Service. You will not interfere or disrupt the Service or servers or networks connected to the Service, including by transmitting any worms, viruses, spyware, malware or any other code of a destructive or disruptive nature. You may not inject content or code or otherwise alter or interfere with the way any Kudolife page is rendered or displayed in a user’s browser or device. All rights not expressly granted by Kudolife are reserved. You will not change, modify, adapt or alter the Service or change, modify or alter another website so as to falsely imply that it is associated with the Service or Kudolife. To access and use the Kudolife Application, you must register as a member by providing a username, password, and valid email address. You must provide complete and accurate registration information to Kudolife and notify us if your information changes. By creating an account you agree not to sell, transfer, license or assign your account, followers, username, or any account rights. With the exception of people or businesses that are expressly authorized to create accounts on behalf of their employers or clients, Kudolife prohibits the creation of and you agree that you will not create an account for anyone other than yourself. You are responsible for all activity that occurs under your account, including any activity by unauthorized users. You must not allow others to use your account. You must safeguard the confidentiality of your password. If you are using a computer or mobile device that others have access to, you must log out of your account after using the Kudolife Application. If you become aware of an unauthorized access to your account, you must change your password and notify us immediately at support@kudolife.com. You further acknowledge that anything you upload, submit, post, transmit, communicate, share or exchange by means of the Service may be viewed on the Internet by the general public, and therefore, You have no expectation of privacy with regard to any such submissions or posting. You are, and shall remain, solely responsible for the User Content you upload, submit, post, transmit, communicate, share or exchange by means of the Service and for the consequences of submitting or posting same. You understand Kudolife has the right, but not the obligation, to monitor all conduct on and content submitted to the Kudolife Application. Kudolife reserves the right to alter, edit, remove, or refuse to post any content, in whole or in part in its sole discretion or to satisfy or comply with applicable laws, regulations and/or legal processes. By registering with the Service, your thereby consent to receive electronic communications, including email and instant messages from Kudolife and other members. As between you and Kudolife, you own all content that you submit to the Service. You grant Kudolife and its affiliates a worldwide, perpetual, irrevocable, non-exclusive, sub-licensable (through multiple tiers) royalty-free license and right to use, copy, transmit, distribute, publicly perform and display (through all media now known or hereafter created), and make derivative works from your content (including without limitation, your name and likeness, photographs and testimonials) for any purpose whatsoever commercial or otherwise without compensation to you. In addition, you waive any so-called “moral rights” in your content. You further grant all users of the Kudolife Service permission to view your content for their personal, non-commercial purposes. If you make suggestions to Kudolife on improving or adding new features to the Service, Kudolife shall have the right to use your suggestions without any compensation to you. Upon termination, all licenses granted by Kudolife will terminate. All terms and provisions hereof shall survive the termination of this agreement. In the event of account deletion for any reason, content that you submitted may no longer be available. Kudolife shall not be responsible for the loss of such content. The links on the Kudolife Sites and/or the Kudolife Application will let you leave the particular Kudolife Site or Kudolife Application you are accessing in order to access a linked site (the “Linked Sites”). Kudolife neither controls nor endorses these linked sites, nor has Kudolife reviewed or approved the content which appears on the linked sites. Kudolife is not responsible for the legality, accuracy or inappropriate nature of any content, advertising, products or other materials on or available from any linked sites. You acknowledge and agree that Kudolife shall not be responsible or liable, directly or indirectly, for any damage or loss caused or alleged to be caused by or in connection with the use of any of the links, content, goods or services available on or through the linked sites. Your participation, correspondence or business dealings with any third party found on or through the Kudolife Sites and Kudolife Application, regarding payment and delivery of specific goods and services, and any other terms, conditions, representations or warranties associated with such dealings, are solely between you and such third party. You agree that Kudolife shall not be responsible or liable for any loss, damage, or other matters of any sort incurred as the result of such dealings. The Kudolife Service is intended for informational and entertainment purposes only. Any nutritional information and terminology used in the Service including “targets” or “ideals” do not constitute and should not be interpreted as medical advice or opinion. Kudolife is not a medical organization and we cannot give you medical advice or diagnosis. Nothing contained in the Kudolife Services should be construed as such advice or diagnosis. The information and reports generated by us should not be interpreted as a substitute for physician or dietician consultation, evaluation, or treatment. YOUR USE OF THE WEBSITE DOES NOT CREATE A DOCTOR-PATIENT RELATIONSHIP BETWEEN YOU AND KUDOLIFE. YOU HEREBY AGREE THAT, BEFORE USING THE WEBSITE AND SERVICES, YOU SHALL CONSULT YOUR PHYSICIAN, PARTICULARLY IF YOU ARE AT RISK FOR PROBLEMS RESULTING FROM CHANGES IN YOUR DIET. DO NOT DISREGARD, AVOID OR DELAY OBTAINING MEDICAL OR HEALTH RELATED ADVICE FROM YOUR HEALTH-CARE PROFESSIONAL BECAUSE OF SOMETHING YOU MAY HAVE READ ON THE KUDOLIFE APPLICATION OR WEBSITES. THE USE OF ANY INFORMATION PROVIDED ON THE KUDOLIFE APPLICATION OR WEBSITES IS SOLELY AT YOUR OWN RISK. Kudolife’s food database has not been reviewed by persons with the expertise required to provide You with complete, accurate, or reliable information. KUDOLIFE DOES NOT (I) GUARANTEE THE ACCURACY, COMPLETENESS, OR USEFULNESS OF ANY NUTRITIONAL INFORMATION IN THE FOOD DATABASE; OR (II) ADOPT, ENDORSE OR ACCEPT RESPONSIBILITY FOR THE ACCURACY OR RELIABILITY OF ANY SUCH NUTRITIONAL INFORMATION. 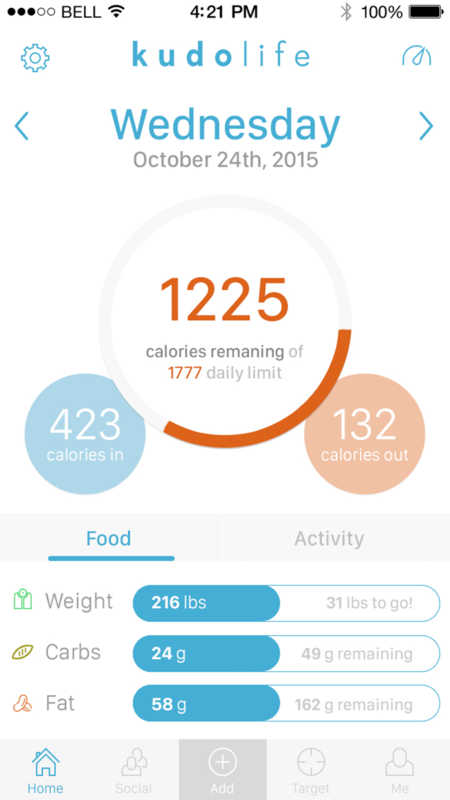 UNDER NO CIRCUMSTANCES WILL MYFITNESSPAL BE RESPONSIBLE FOR ANY LOSS OR DAMAGE RESULTING FROM YOUR RELIANCE ON NUTRITIONAL INFORMATION. You are solely responsible for ensuring that any nutritional information in the Food Database is accurate, complete and useful. Kudolife provides the Kudolife Application on an “as is” and “as available” basis. You therefore use the Kudolife Application at your own risk. Kudolife expressly disclaims any and all warranties of any kind, whether express or implied, including, but not limited to the implied warranties of merchantability, diet for a particular purpose, non-infringement, and any other warranty that might arise under any law. Without limiting the foregoing, Kudolife makes no representations or warranties. Concerning sites and resources outside of the Kudolife Application, even if linked to from the Kudolife Application. Kudolife reserves the right, but disclaims any perceived, implied or actual duty, to monitor disputes between Website members. You agree to hold Kudolife harmless in connection with any dispute or claim You make against any other member. To the extent any disclaimer or limitation of liability does not apply, all applicable express, implied, and statutory warranties will be limited in duration to a period of thirty (30) days after the date on which you first used the Kudolife Application, and no warranties shall apply after such period. Although personal coaching is an important part of your success, your results will be solely dependent on your unique health condition(s) and your personal commitment to following a balanced diet. Kudolife meal plans are not a substitute for direct, personal, professional medical care and diagnosis. None of the meal plans should be performed or otherwise used without clearance from your physician or health care provider first. To the fullest extent permitted by law: (i) Kudolife shall not be liable for any direct, indirect, incidental, special, consequential, or exemplary damages, including but not limited to damages for loss of profits, goodwill, use, data or other intangible losses; and (ii) Kudolifes total liability to you shall not exceed the amounts paid by you to Kudolife over the twelve (12) months preceding your claim(s). You acknowledge that the Kudolife Site and Application contain software, graphics, photos, or other material (collectively, “Content”) that are protected by copyrights, patents, trademarks, trade secrets or other proprietary rights, and that these rights are valid and protected in all forms, media and technologies existing now or hereafter developed. The Kudolife name, logos and affiliated properties, are the exclusive property of Kudolife Inc. All other trademarks appearing on the Services are trademarks of their respective owners. Our partners or service providers may also have additional proprietary rights in the content which they make available through the Services. The trade names, trademarks and service marks owned by us, whether registered or unregistered, may not be used in connection with any product or service that is not ours, in any manner that is likely to cause confusion. Nothing contained on the Services should be construed as granting, by implication, estoppel or otherwise, any license or right to use any of our trade names, trademarks or service marks without our express prior written consent. Kudolife respects the intellectual property of others, and we ask our users to do the same. Each user is responsible for ensuring that the materials they upload to the Kudolife Application do not infringe any third party copyright. Kudolife will promptly remove materials from the Kudolife Application and Site in accordance with the Digital Millennium Copyright Act (“DMCA”) if properly notified that the materials infringe a third party’s copyright. In addition, Kudolife may, in appropriate circumstances, terminate the accounts of repeat copyright infringers. A statement that you have in good faith believe the copyrighted work is not authorized by the copyright owner, its agent, or the law.